The landmark Victorian building in London, The Residences pf 488 University Avenue was announced as the Overall Winner of the prestigious ABB LEAF (Leading European Architecture Awards), which was held in September 2017. The project was chosen from 78 shortlisted entries across 17 categories, with projects spanning over 25 countries. The building was designed by II BY IV Design and showcases a stunning entrance with rich wood panelling, glowing glass walls and eclectic finishings that seem to magically transport the indoors out and the outdoors in. The extraordinary attention to detail led to a chic, luxurious and thoroughly modern interior atmosphere that lives up to the iconic nature of the building. II BY IV Design also won the Interior Design Award – Future category for the project. The judging panel consisted of 10 jurors and included Michele Pasca di Magliano and Viviana Muscettola of Zaha Hadid Architects, Kai-Uwe Bergmann of BIG – Bjarke Ingels Group, and Vanessa Brady, President of the SBID. Residences of 488 University, a radiant 55-storey tower of glass and steel ascending from a jewelled podium, will be completed in 2018. A new 37-storey condominium with 453 luxurious units will rise above the office tower, with construction occurring while the offices below remain open and operational. The offices are accessed through the commercial lobby at grade that features floor-to-ceiling glazing and affords a direct connection with the exterior and public transit. Connected to the residential lobby, the combined volumetric space is reminiscent of a jewellery vitrine, merely separated by a mirrored partition, making the voluminous space feel even more grand and ceremonial. 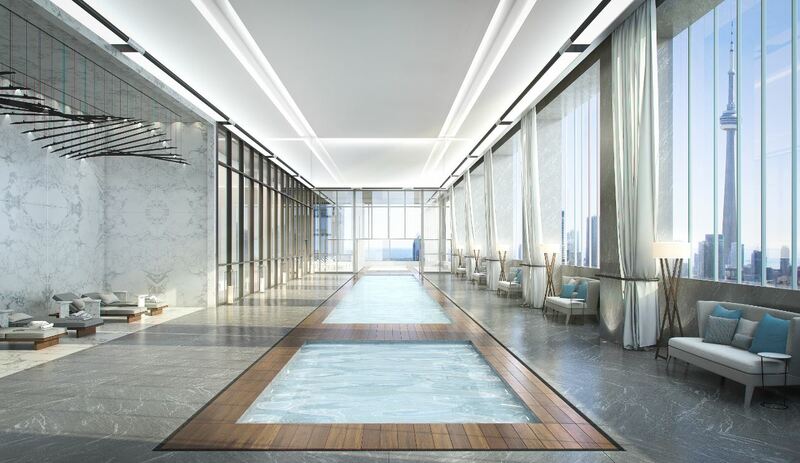 With over 30 000 square feet of lifestyle amenities, this condominium is designed to be an urban oasis, with a combination of serenity and modernism in each suite. Residents can look forward to beautiful layouts, floor-to-ceiling windows, oversize terraces, and impeccably detailed finishes and design elements. II BY IV Design says that the success of the project was the result of an amazing and rewarding collaboration with the client, Amexon Development Corporation and the building’s architect, CORE Architects. According to II BY IV Design, Amexon Development understands the value of exceptional design. In 2016, the project also won the competitive Show Flats and Development category at the 2016 SBID (Society of British and International Design) International Design Awards. For more information, visit www.v2com-newswire.com or www.iibyiv.com, to which full thanks and acknowledgement are given.